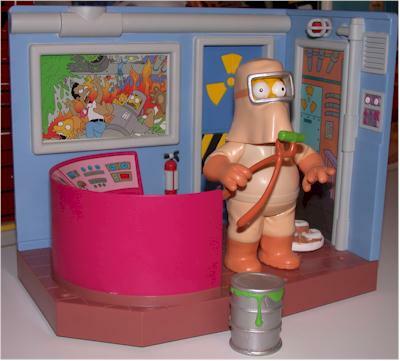 Once again, Rick at New Force Comics came through for me on Playmates product, and sent over the first two in the series of Simpsons Playsets. While several have been promised, we only have the Living Room and Power Plant so far. Each plays various voice clips from the show, depending on which characters are attached to the base. Up to three characters can be attached to each playset at one time. The playset is very well made, nice and sturdy. The pegs that attach to the feet to allow the various sounds to play are also well made, and don't look too likely to break off. 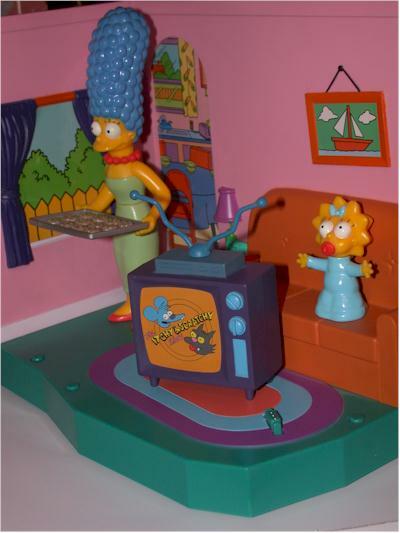 The accessories with the Living Room are good - Maggie and Marge are the figures, with a tray of cookies, TV and bag of groceries. The only minus here is that with three figures in the playset, the TV doesn't have any place to sit. This playset even out shines the Living Room. While it has the same sturdy construction, the various graphics are fantastic, particularly the neat shot of everyone running and screaming from the disaster in the background. 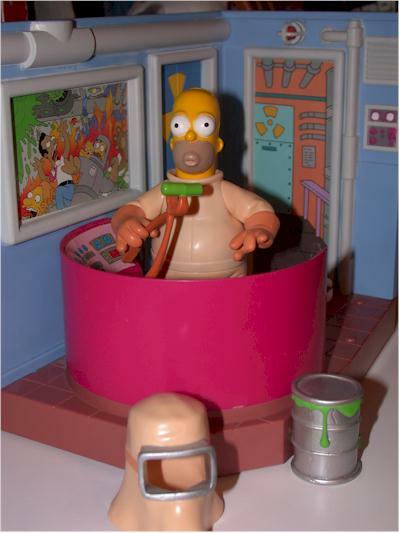 Plenty of attention to detail make this a really terrific set, and the Homer figure isn't bad for a variation, particularly since it's a completely different sculpt from top to bottom. 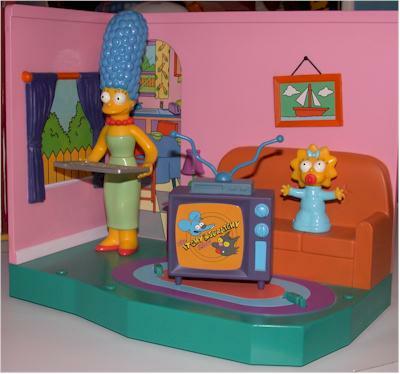 This is a terrific idea, and Playmates has done a wonderful job catching the essence of the Simpsons. The only improvement would have been if these had been slightly larger, to house the figures a little better. But that's a minor complaint next to the other excellent features.